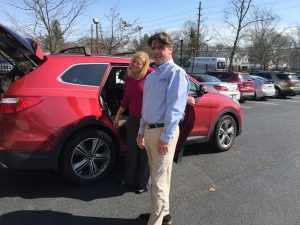 Stephen Bott and Renee Gaskin pictured, loading the car for our yearly Easter Basket giveaway. Each year The Allied Group engages its team members to contribute and provide Easter Baskets to Catholic Charities in support of local families in need. Caitlin Smith led the charge and organized The Allied Group’s efforts. Assisting in gathering and pulling together the 25 baskets were Shirley Blunda and Renee Gaskin as well as financial contributions from employees company wide. “It is nice to see these baskets make it to children between the ages of 4 to 17 here in our local community.” Bob Smith, President of The Allied Group welcomes the good work the staff does throughout the year in alignment with the core values of the company. “This type of outreach really touches two of our five core values in being socially responsible and putting family first. It is nice to bring joy to families and a smile on the face of kids in need,” he commented.